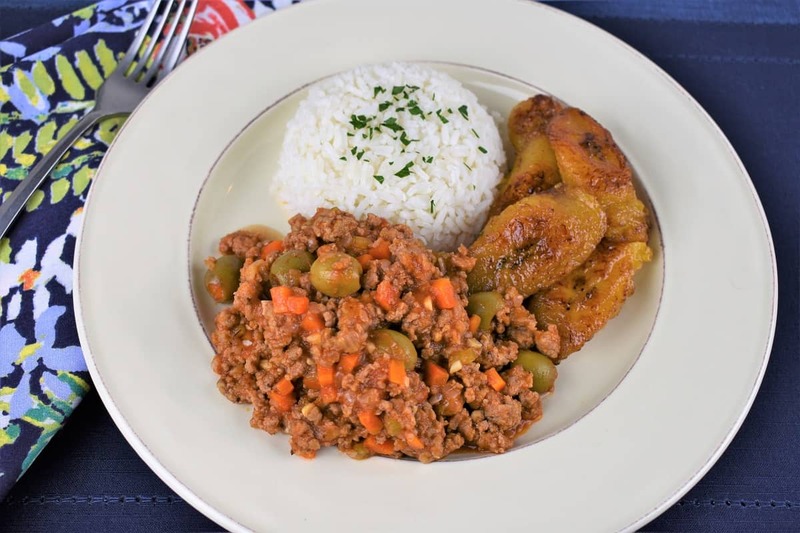 Traditionally, picadillo is made with ground beef, but this turkey picadillo recipe is just as delicious. Don’t roll your eyes, and don’t worry, all the flavor is still there. A combination of vegetables and spices make sure of that. We use lots of garlic and a less conventional – yet delicious mirepoix. A mirepoix is a combination of onions, carrots and celery that’s gently cooked in oil. It adds amazing flavor to food! 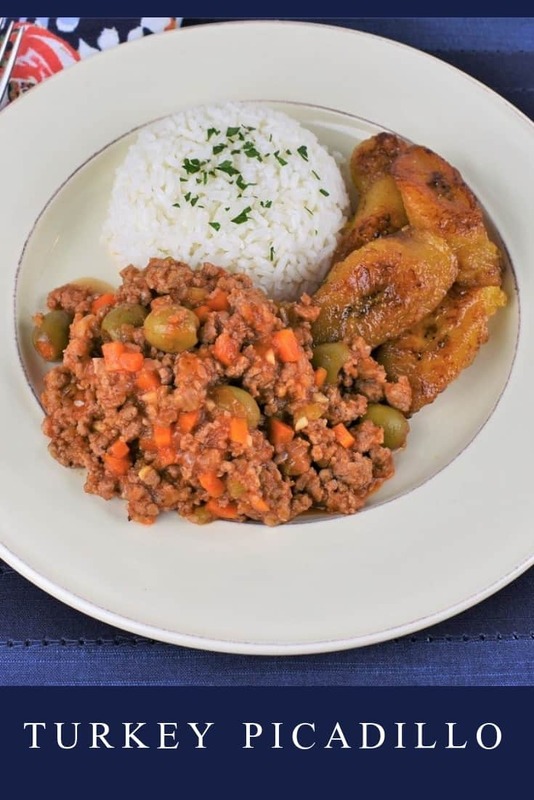 Serve the picadillo with white rice and sweet plantains, for a Cuban comfort meal that will leave you completely satisfied. If you’re looking for more easy and delicious recipes try this Cuban cube steak or this churrasco & chimichurri recipe that’s perfect for the weekend. In a small bowl combine the salt, cumin, dried oregano and black pepper. Stir with a fork to combine the seasoning well. Heat the olive oil in a large, deep skillet over medium heat. Add the onions, carrots and celery to the skillet. Cook the vegetables for 5-7 minutes until the onions are translucent, stirring frequently. Add the garlic and the seasoning mix, stir well to combine. Cook 1-2 minutes, stirring frequently. Raise the heat to high, add the ground turkey, stir, breaking up the meat using a wooden spoon or a spatula. 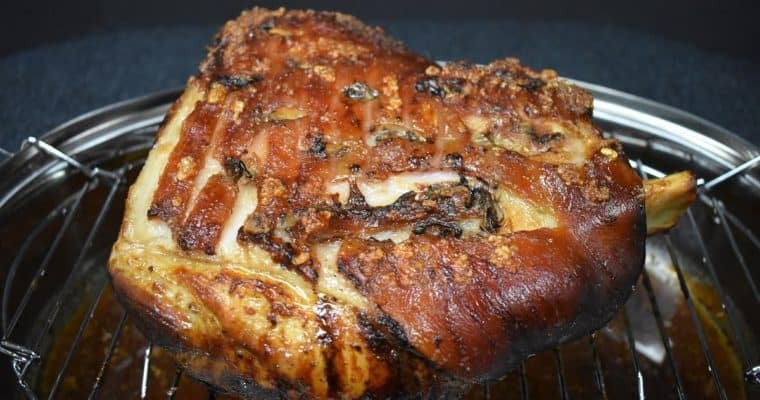 Cook 3-5 minutes to brown the turkey. Add the white wine to the skillet; cook about 1-2 minutes until most of the liquid evaporates. Lower the heat to medium-low to low and add the tomato sauce, water and olives, stir to combine. Here’s a tip, I like to add the water to the can of tomato sauce and give it a swirl, that way I get every last drop out. Cover the skillet and cook for approximately 25-30 minutes to allow the flavors to develop and combine, stirring occasionally. 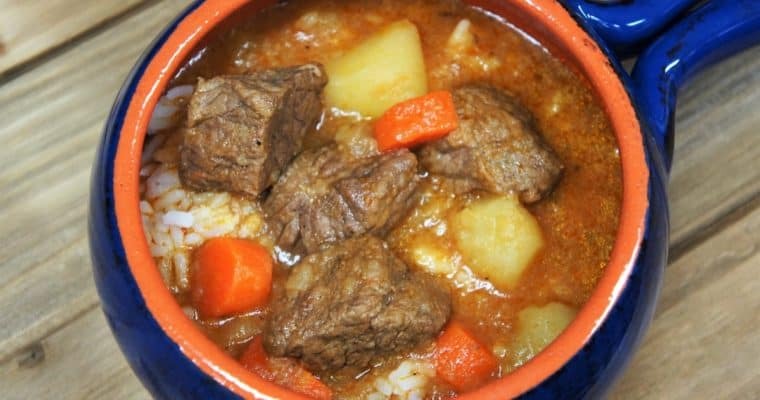 Keep the picadillo at a simmer, if the liquid is boiling vigorously, lower the heat a bit. After 10-15 minutes, set the heat to low. You don’t want the picadillo dry out; you want it just a little saucy. There are two things about using ground turkey that can be a turn off. First, that pale grayish color is not appetizing at all. We solve that problem with spices and tomato sauce. The second thing is those little stringy pieces that are impossible to break-up once the ground turkey hits the skillet. They look funny and they scream: Ground Turkey before anyone gets a chance to taste it. Here’s how I deal with this pesky problem: Open the package, use a fork to gently press and fold the turkey, destroying the pattern. Try to not overwork the ground turkey, combine it just enough to get rid of the strings. Once you drop the turkey into the skillet you’ll still need to break it up with a wooden spoon or spatula, but stringy turkey will be a thing of the past. Add the white wine to the skillet; cook about 1-2 minutes until most of the liquid evaporates. Lower the heat to medium-low and add the tomato sauce, water and olives, stir to combine. 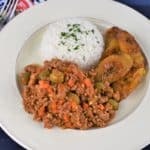 Cover the turkey picadillo and cook for approximately 25-30 minutes to allow the flavors to develop and combine, stirring occasionally. Keep the turkey picadillo at a simmer, if the liquid in the skillet is boiling vigorously, lower the heat. After 10-15 minutes, set the heat on low so the picadillo does not dry out.